1. Prepare Garlic Butter: combine butter, parmesan, garlic, Italian seasoning, parsley. 2. Spread Garlic Butter over bread. Bake at 350 for 20 minutes, until browned. 3. 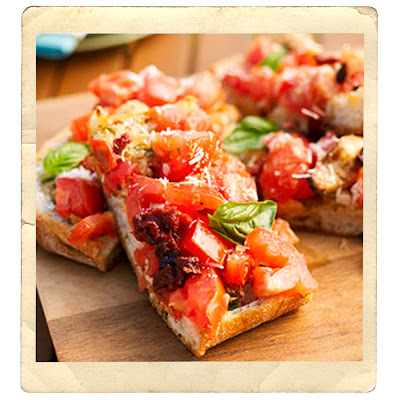 While bread is baking, prepare Basil Salsa: In a medium-size sauté pan over medium heat. combine oil and garlic. Cook until lightly browned, about 2 minutes. Add tomatoes and heat through. Stir in basil, salt and pepper and remove heat. 4. After baking bread for 20 minutes, top with tomato salsa, and Parmesan cheese. 5. Slice into pieces and serve.